1) (Seaside and Lundie, Scotland). Gu. a chev. or, betw. two cinquefoils in chief, and a hunting-horn in base ar. garnished az. Crest—A ship under sail. Motto—Disce pati. 2) (Earl of Camperdown). Gu. a representation of the gold medal conferred upon the first Viscount by George III. 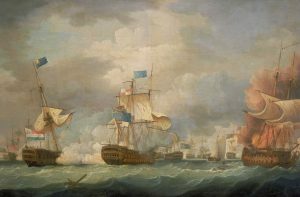 for the victory off Camperdown, ensigned with a naval crown, and subscribed Camperdown, betw. two roses in chief, and a buglehorn in base ar. strung and garnished az. Crest—A dismasted ship ppr. Motto (above)—Disce pati. Supporters —Dexter, a female figure, winged, crowned with a celestial crown, a scarf across her garments, resting her exterior hand on an anchor, her interior hand holding a palm branch; sinister, a sailor holding in the exterior hand a union flag, the tri-coloured flag wrapped round the staff. Motto—Secundis dubiisque rectus. 3) (Ardounie, Scotland). Gu on a chev. betw. two cinquefoils ar. in chief and a hunting-horn of the same in base, viruled and stringed az. three buckles of the last. Crest—A greyhound issuant ppr. collared or. Motto—Vivat veritas. 4) (Mott, Scotland). Gu. on a chev. betw. two cinquefoils in chief and a hunting-horn in base or, three buckles az. 5) (Edinburgh, 1786). Gu. on a chev. betw. two cinquefoils in chief ar. and a hunting-horn in base or, stringed and viruled vert three escutcheons of the field. Crest—A dexter hand grasping a scymitar ppr. hilted and pommelled or. Motto—Deo juvante vinco. 6) (Parkhill, co. Forfar). Gu. a chev. engr. or, betw. two cinquefoils in chief ar. and a hunting-horn in base of tha last garnished az. Crest—A ship in distress in the sea ppr. Motto—Disce pati. 7) (Beveridge-Duncan, Damside, co. Perth, 1813). Quarterly, 1st and 4th, gu. a chev. erminois betw. two cinquefoils in chief ar. and a hunting-horn of the last in base stringed az., for Duncan; 2nd and 3rd, vert two beavers combatant or, the base wavy ar. and az., for Beveridge. Crest—1st: A ship under sail in a sea ppr. the maintop sail and fore­top sail each charged with a cinquefoil gu. and the foretack with a hunting-horn of the last stringed az., for Duncan; 2nd: Out of a mural crown or, a demi beaver ppr., for Beveridge. Mottoes—Disce pati; Perseverando. 8) (Marylebone, London, bart., extinct 1774; Sir William Duncan, M.D., Physician Extraordinary to George III., younger brother of Alexander Duncan, grandfather of the 1st Viscount Duncan, was so created 1764, d. s. p.). Gu. two roses in chief and a buglehorn in base ar. stringed and garnished az. 9) or Duncum – Sa. five eagles displ. in cross ar. 10) (Haldane-Duncan, Earl of Camperdown). Quarterly, 1st and 4th, grand quarters gu. two cinquefoils in chief ar. and a buglehorn in base of the second stringed az. in the centre as an honorable augmentation, pendent by a ribbon ar. and az. from a naval crown or a gold medal, thereon two figures the emblems of Victory and Britannia, Victory alighting on the prow of an antique vessel crowning Britannia with a wreath of laurel, below the medal the word “Camperdown,” for Duncan; second and third grand quarters counterquartered first and fourth ar. a saltire engr. pa., for Haldane; 2nd, ar. a saltire betw. four roses gu., for Lennox; 3rd, or a bend chequy sa. and ar., for Monteith; in the centre a crescent az., for diff., all for Haldane, of Gleneagles. Crest—On waves of the sea a dismasted ship ppr. Mottoes—Above the Crest, Disce pati. Below the shield, Secundis dubiisque rectus. Supporters—Dexter, an angel mantle purpure on the head a celestial crown, the right hand supporting an anchor ppr. in the left a palm branch gold, sinister a sailor habited and armed ppr. his left hand supporting a staff, thereon hoisted a flag az. the Dutch colours wreathed about the middle of the staff. This is a Scottish and Irish patronymic or baptismal surname meaning the son of Duncan, an old personal (first) name that derives from the Gaelic words dun (a fortress) and ceann (a head of chief), which translates to strong-headed, likely a personality trait of the original bearers of this masculine given name. Another author asserts it means “brown head”, assumedly referring to the brown hair of the bearers. Another author states the personal name was originally Donnchadh, and means chieftain, a name was also Anglicized in Ireland as Donaghue, Donahue, and Donagh. One author states the male given name Donnchad actually derives from the ancient Celtic first name Donncatus, deriving from the words donn (brown) and cath (warrior). There is a rock at Glan Usk, Wales were the name is spelled Dunocatus, which may imply the name comes from dun, a fortress, and hence means a “fort warrior”. 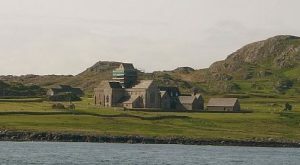 A man named Dunchad, the 11th Abbot of Hii (Iona) died in 717 AD. The family, which first became established in Forfarshire and modern day Angus, claim descent from said Abbot, who was also the progenitor of the Robertson. On the maternal side, the descend from King Duncan of Scotland (reigned between 1030 and 1040 AD). There was also a King of Dalriada named Dunchad or Duna Mac Conaing who ruled in the 600s AD. One source asserts the family descend from the Picts, a tribe of people who lived in northern Scotland during the Late Iron Age (50 BC to 100 AD) and the Early Medieval periods. Some spelling variants or names with similar etymologies include Duncane, Dunkin, Dunkan, Dunkane, Donkin, Duncann, Dunican, Dunncane, Donnac, Donekyn, Donekan, Dokcaine, Dokan, Docane, and others. The last name Duncan ranks 201st in popularity in the United Status as of the 2000 Census. The name ranks particularly high in the following six states: Kentucky, Missouri, Tennessee, Georgia, South Carolina, and Arkansas. The surname Duncan frequency/commonness ranks as follows in the British Isles: England (227th), Scotland (24th), Wales (480th), Ireland (1,052nd) and Northern Ireland (306th). In England, it ranks highest in county Northumberland. In Scotland, the surname Duncan ranks highest in Kincardineshire, Aberdeenshire, Angus, Fife, and Bute. In Wales, it ranks highest in Caernarfonshire. In Ireland, it ranks highest in county Donegal. In Northern Ireland, it ranks highest in county Tyrone. The name is also present throughout the remainder English speaking world: Canada (284th), New Zealand (82nd), Australia (164th), and South Africa (571st). The earliest known bearer of this surname was Hugh Duncan who was recorded in the Hundred Rolls of Lincoln, England in 1275 AD. Other early bearers include Ralf Donekan of Somerset in 1280 AD, William Donekyn of Sussex in 1332 AD, and John Duncan of Berwick-on-Tweed in 1367 AD. The Poll Tax of Yorkshire in 1379 AD lists one bearer of this last name: Willelmus Dunkan. The lineage or ancestry of this branch of the Duncan family tree begins with William Morrison Duncan of Brighlington, county York, England who was born in 1771, the son of John Duncan. In 1812, he married Elizabeth, daughter of Robert Cockill of Birstall Leeds. His only son was Sir Surr William Duncan, 1st Baronet. Sir William was of Hosforth Hall, Guideley,York who was a Justice of the Peace and Deputy Lieutenant born in 1834. He was created a Baronet in 1905. 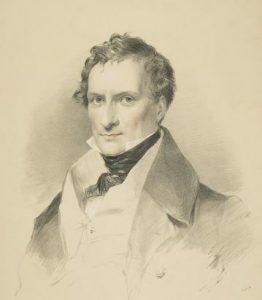 In 1856, he married his first wife, Mary, daughter of William Kenion of Yeardon, and had three issue with her as follows: Sir Frederick William (2nd Baronet), Florence Jane (married Hans Hermann Grosse, part of the 3rd Infantry Regiment of Saxony), and Louisa Mary (married Charles Edwin Gray of Larkfield, had issue). He later married Elizabeth, daughter of Thomas Copley Heaton of Wharf View. 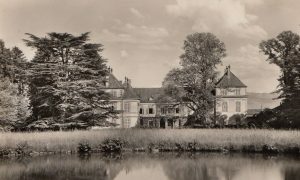 He died in 1908 and was succeeded by his only surviving son, Sir Frederick William Duncan, 2nd Baronet, who was born in 1859. Sir Frederick was a Consul-General for Austria starting in 1912. In 1922, he married Mrs. Marion Kingsland, daughter of Henry Le Grand Canon, and had issue with her. He was succeeded by his eldest son Charles. Sir Charles Edward Oliver Duncan was the 3rd Baronet who was born in 1890. He succeeded his father in 1929 and served in the First World War as part of the Royal Horse Guards. The Duncan Coat of Arms (mistakenly called the Duncan Family Crest sometimes) is blazoned in heraldry as follows: Azure on a chevron between in chief two crosses flory and in base a bugle horn stringed or, a round buckle of the field. Crest: Between two buffalo’s horn proper a demi-greyhound or. This branch of the family tree resides at Chateau Les Crenees, Mies (Vaud), Suisse, Villa Beau-Desert, Cannes, France. Johannis Duncan was born in Rothybrisbane, Aberdeen, Scotland around 1425 AD. He was the father of David. This David was born in the same town around 1443 AD. He married Mario Bogl and had a son named Allan. This Allan Duncan was born in Garbred, Fife, Scotland around 1460. He married Jonat Crosby and had a son with her named William. This Sir William Duncan was born in Garbred, Fife in 151. He married Lady Agnes Robinson and had two issue with her: John and Katherine (Johnston). His son John was born in Perth, Scotland around 1530. He married Jonet Marie Andro and fathered numerous children with her, including: Marion, Johanna, Petrus, Mareen, James, Thomas, Andrew, and William. His son Thomnas was born in Edinburg, Midlothian around 1596. He married Bridget Tilney and had three sons with her named David, Peter, and Michael. His son Peter was born at St. Andrews, Edinburgh, Baxter, Scotland in 1597 and he married Sarah Elizabeth Stone, with whom he had four sons: Peter Jr. Nathaniel, Robert, and William, who also spelled the surname Dunkin. His son Peter Duncan Jr. (also spelled Dunkin or Dunkan) was born in Edinburgh in 1624 and he later went to colonial America (he died in Nomini Creek, Virginia) sometime after 1646. He married Bessie Caldwell and had four issue with her: John, Charles, Henry, and Ann (Cornhill). His son Charles was born in Westmoreland, Virginia in 1647. He married Frances Elson and had a son with her named Henry. This Henry was born in Cople Parish, Virginia in 1710. He married Rebecca Bragg Reid (or Read) and they had a son named Coleman. This Coleman Lewis Duncan was born in 1742 in the same parish. He married Mary Lyne and had a son with her naked Charles. This Charles was born in Cameron Parish, VA who married Janet (or Jenny or Jane) Musick They had a son together named Coleman Lewis. This Coleman was born in Louisville, Kentucky in 1803 and he married Ascenith Hess, having a daughter with her named Anna Maria, who was born in Illinois in 1846 and married Andrew Theodore Steele, and had three children with her named Louis Perry, Bernice Allen, and Clifford Benton, who were all born in the 1870s. A one Finlay Duncan was born between 1491 and 1551 AD. He married Margaret Kinloch and had a son with her named William. This William was born in 1556 AD and he married Katherine Wedderburne, with whom he had a son, also named William. This William Duncan was born between 1574 and 1634. 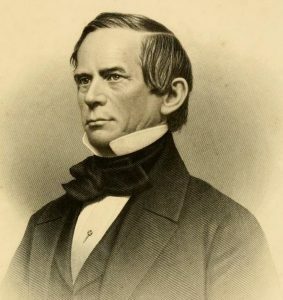 He married Elizabeth Davidson and had a son with her named Alexander. Alexander was born in 1652 and he married Anna Drummond. They had a son together named Alexander Duncan of Lundie, who was born between 1657 and 1717 and he married Isabella Murray. They had a son together named Alexander. This Alexander was born between 1666 and 1726, and he married Helen Hadane, with whom he had two issue: Admiral Adam Duncan, 1st Viscount Duncan of Camperdown and Katherine. His son Admiral Adam Duncan was born in 1731 in Lundie, Angus, Scotland. He was the hero of the Battle of Camperdown, considered to be one of the greatest and most brilliant victories in military history. He married Henrietta Dundas and had the following children with her: Jane, Robert D. Duncan-Haldane, 1st Earl of Camperdown of Lundie, Sir Henry Duncan, Robert Dundas-Duncan-Haldane, Mary Tufton, Adamina (Countess of Stair), and Henrietta (Fergusson). His son Sir Henry was born in 1786 and died in 1835. 1) Jabez Duncan, a soldier in King Philp’s War under Captain Turner’s Company in 1676. 3) Nathaniel Duncan of Dorchester, 1630, who came likely aboard the Mary and John, and was one of the first settlers in that town. He was a freeman in 1635 and served as a Captain in an artillery company in 1638. He was an auditor and representative who spoke Latin and French. He likely married Elizabeth and had sons named Nathaniel and Peter. He died around 1668. Thomas Duncan Esquire, who was appointed Governor of New York, came in June of 1634. Other early settlers in colonial America bearing this surname include Ester Duncan (Virginia 1700), John Duncan (New Hampshire 1716), David Duncan (New Hampshire 1718), George Duncan (Georgia 1737), and Isaac Duncan (Philadelphia 1767). In Canada, one of the earliest settlers bearing this last name was John Duncan who came to the province of Nova Scotia in 1749. In Australia, one of the first bearers was William Forbes Duncan, a convict from Aberdeen, Scotland who came to Van Diemen’s Land (modern day Tasmania) aboard a ship named the Asia in July of 1823. In New Zealand, A. Duncan and J. Duncan came to the city of Wellington aboard the Royal Merchant in 1840. 1) Gules a chevron or between in chief two cinquefoils and in base a hunting horn argent [garnished azure]. Crest: a ship with three sails spread on fore mast, two on main, and one on muzzin mast. Motto: Disce pati. Embr. hatchment made by Isabella Duncan, daughter of Mrs. Isabella Caldwell Duncan. Owned by Mrs. Richard Morgan, Plymouth, Mass., daughter of Judge Davis. 2) Gules a chevron or between in chief two trefoils and in base a hunting horn [argent] stringed [azure]. Crest: a ship with sails and flags. Motto: Disce pati. Bookplate James H. Duncan, Haverhill, 1820. Crozier’s General Armory (1904) and Matthew’s American Armoury (1907) and Bluebook (1907) do not contain an entry for this popular Scottish last name. We have 10 coats of arms for the Duncan surname depicted here. These 10 blazons are from Bernard Burke’s book The General Armory of England, Ireland, and Scotland, which was published in 1848. The bottom of this page contains the blazons, and in many instances contains some historical, geographical, and genealogical about where coat of arms was found and who bore it. 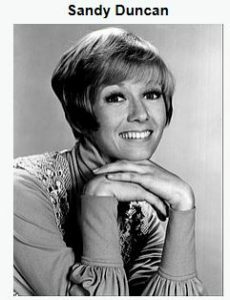 There are hundreds of notable people with the Duncan surname. This page will mention a handful. 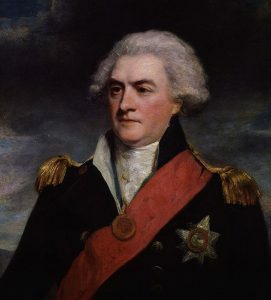 Famous people with this last name include: 1) Adam Duncan (1731-1804) who was 1st Viscount Duncan who was a British Admiral born in Dundee, Angus who defeated the Dutch fleet at Camperdown, 2) Henry Duncan (1735-1814) who was an officer in the British Royal Navy who served in the American War of Independence, 3) Donald Bradley Duncan (1896-1975) who was an admiral in the United States navy during World War II, 4) David Edwin Duncan (1945) who is a retired baseball pitcher from the MLB who played for four different teams betwee1967 and 1976 and also coached between 1979-2011, 5) Sanra Kay “Sandy” Duncan (1946) who was an American stage and television actress, singer, dancer, and comedian known for her role in the situational comedy The Hogan Family and for the Broadway musical Peter Pan, 6) Arne Starkey Duncan (1964) who was the 9th Secretary of Education during the Obama administration, 7) Robert M. Duncan (1951) who was a chairman of the Republican National Committee from 2007-2009, born in Oneida, Tennessee, 8) William Addison Duncan(1836-1884) who was a member of the U.S. House of Representatives from Pennsylvania between 1883-1884, 9) Walter Leslie Duncan (1883-1947) who was a Senator of New South Wales, Australia between 1910-1931, and 10) Lesley Duncan (1943-2010) who was an English singer-songwriter born in Stockton-on-Tees who had success in the 1970s. The two most prominent heraldic symbols in the Duncan Coat of Arms (often erroneously called the Duncan Family Crest) are the hunting horn (also known as a bugle horn) and cinquefoil, each of which conveys or signifies a unique meaning. The hunting horn, or bugle horn has a distinctive shape, being curved almost into a semi-circle, it can be decorated with bands of a different colour and typically hangs from a string, also coloured. 195. Apart from its obvious reference to the pursuit of hunting, it has also been used in allusion to the name of the holder (HUNTER of Hunterston) and Woodward suggests it is also associated with those who have rights or obligations to the forest. The main tincture (color) in these armorial bearings (mistakenly called family shields) is gules (red), which signifies military strength, warriors, martyrs, and magnanimity. Don’t know how much I can help you but,my name is Kevin Duncan , I am from the United States,I have been doing family research and have gone back to the year 1414 and beyond that. I myself was born August 01,1958, my clan has been found to come from England,Scotand and Ireland,migrated here in the 1700’s and maybe before that yet.I do know that there was a Reveren Duncan from England that I believe was hung ,because of his beliefs of religion, he also had a son that had followed in his footsteps but migrated to the U.S., and settled in the state of Pennsylvania.